Joseph's Grainery: Do you know where your food comes from? We, here at Joseph's Grainery are definitely proponents of knowing where your food comes from. So we want to show you what the whole grains growing on our farm look like. 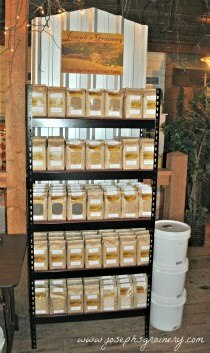 These are the whole grains that will make their way to your kitchen table when you order from Jospeh's Grainery. Joseph's Grainery Soft White Winter Wheat. We parked one of Grandpa's Fords in the field so you could tell just how tall it is at this point. You can see the heads forming at the top of the plant. Joseph's Grainery Dark Northern Spring Hard Red Wheat. You'll notice that the wheat in this photo isn't as mature as the plants in the top photo. This is because this crop was planted in the Spring, while the crop in the top photo was planted last Fall. That is Steptoe Butte that you see in the background of the photo. Now you can say that you've seen pictures of where your whole grains are grown!